So somebody contacted me about using a glyph from Cormorant (the rapier-shaped alternate /daggerdbl/) for an album cover, which is certainly no problem, and about possibly commissioning an adaptation of said glyph to the client's ideas. @Dave Crossland, do I understand correctly that I am allowed to take money for working on a part of Cormorant if I then release that new part under the OFL as well? Basically I'd just let the new glyph exist in the Cormorant fonts. If so: What's a reasonable amount of money to ask for something like this? I figure it's going to be about 2–3 hours of work on my side, and I'm not a trained professional. Maybe $50? I'd like to stay on the affordable side, too, since it's a fun project. Fun quickie project? I'd say $100 to $500, depending on pocket depth. No amount of money can buy that experience... and conversation piece! If the modified glyph is just for use on the album cover, does it need to be a font edit, or could you just convert to outlines and create the modified shape in e.g. Illustrator? Is there a practical need or usability advantage in having a custom version of the font incorporating this modification? John: Well I don't have Illustrator and work best in Glyphs. I'm also not allowed to sell derivatives of my Google Fonts, but I believe I can be funded to expand them. Even if you use Glyphs, you could still do it like John suggests. Does Glyphs not have any export-as-graphic function? Or even if it doesn't, you make a font, then use that to create a document and export a PDF (or whatever graphic format) from that. Or just bundle some gum with it. The OFL restriction on selling derivatives is byzantine. Hey @Christian Thalmann, have you seen the application called Inkscape? It's free and open source. I've never used it so I can't speak to how well it works but it seems like it might help you a bit? And as far as customizing a glyph from your font. Aren't you just creating a "logo" from said glyph? You're not creating a whole derivative "font" ... Right? 50 is way too less especially if its going to be used as a logo. Album covers don't come with logos as far as I know unless you mean an identity for the band or the label. I think in this case the glyph will be used as artwork for the cover but if they're wanting a logo you're going to have to take into account of usage, royalty of some kind, etc. Find out how it'll be used and how prolific they are before you settle on 50. Hey @Christian Thalmann, have you seen the application called Inkscape? It's free and open source. I've never used it so I can't speak to how well it works but it seems like it might help you a bit? Inkscape is, IMHO, not that great. You're better off spending the $20 a month for the subscription version of Illustrator CC. And even with a simple job, I would charge $150 - $400 depending on time. Sometimes those "easy" jobs turn out to be anything but. Generally, even for the simplest of jobs I tend to charge $150, but your mileage may vary. And depending on where the client is, glyph shapes may not be protected by IP at all, this making it perfectly legal to do a copy of said shape. I use Inkscape all the time and can vouch for its powerful feature set and general usefulness. Logo: I probably used the word wrongly. The client wanted to use it for an album cover; didn’t say more. I guess I should call it a graphic or something. IP rights: I’m not so much worried about the laws on the client side as about the contract I signed with Google Fonts that prohibits me from selling parts of Cormorant. Inkscape: Have it, wasn‘t too fond of it. It exported very stripey PDFs when I first used it. It might be better now, dunno. I used PowerPoint for my last few choir concert posters. If 150.– sounds right for a pro, I’m probably going to go with 100.–, maybe with a caveat that it’ll go up to 150.– if it escalates to more than x work hours... it’s my first paid graphic design job after all. 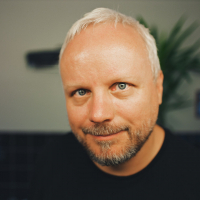 A freelance graphic designer in Switzerland makes about CHF120, in the U.S. about $70 an hour. The current exchange rate is about 1 to 1.09. @Christian Thalmann aren’t you the copyright owner of Cormorant? You can do whatever you want, release your fonts or their derivatives under whatever new license you want, free or not. You don’t have to include those modifications in the SIL OFL version of your own font unless you want to. If there are other copyright owners, they might be willing to allow you to do so. Denis: I've signed a contract with Google Fonts with extra conditions beyond the OFL itself, in exchange for the very generous stipend for my typeface development. I agree that I probably don't have to leave the custom glyph in Cormorant, but I'd have to release it under the OFL, so leaving it in Cormorant is just the easiest way to comply. I've made an offer for US$ 120.— now; let's see how it goes. @Christian Thalmann I'm not Dave but he must be very busy to have not replied. To answer your original licensing question: my understanding is that under the OFL you can charge for labor (not licensing) and as the original designer your only obligation with a derivative work is to retain the OFL (if you weren't the owner of the font name you'd also need to change the name). That said, with logo work in the US it's traditional not just to charge for labor but also to assign the rights to the logo so it can be trademarked. I'm not sure how that relates to libra at all. We don't do enough logo work for me to have looked into this. €3000 for the album cover – 95% indie/artist/buddy discount. Specified on the invoice. But the satisfaction of doing it cannot be turned into a number. Alright, the deal is on! Here's what I have so far. The left is Cormorant's rapier-shaped alternate /daggerdbl/ glyph that caught my client's eye (the /dagger/ itself is, of course, a main-gauche). 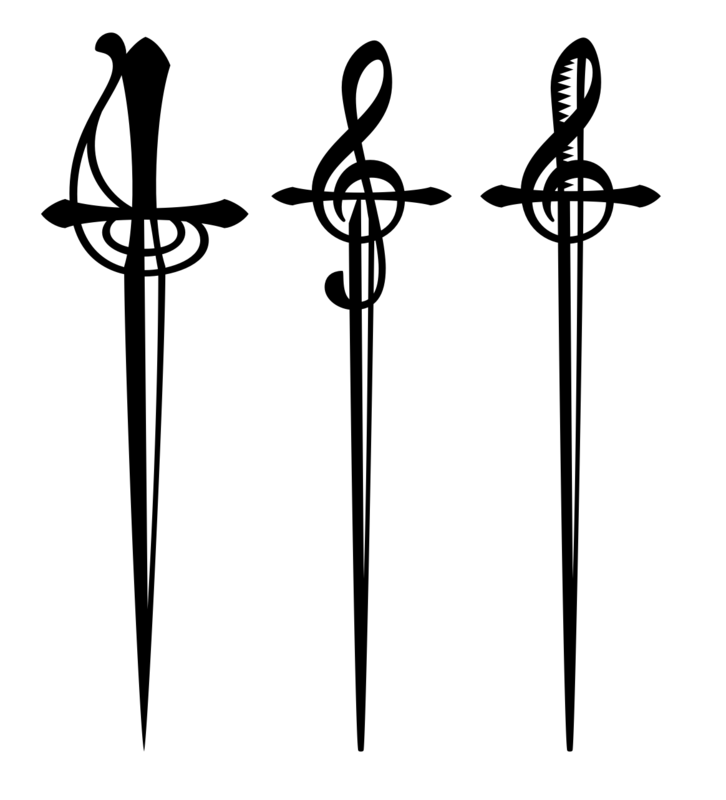 He wanted to blend in some elements of a treble clef, so I tried simply splicing it onto the rapier blade (middle), but didn't like the fact that it loses its functionality as a sword that way. So I drew an actual rapier with a clef-like basket hilt instead (right). I think it's still quite recognizable that way. Definitely the right one. Love the integration into the sword! Very nice! But why make the blade thinner? Oh, I don't know. Making the blade thinner might make it on point. I wanted it to look more like an actual rapier. The client likes the flaring at the base of the original, though, so I’m probably going back to that blade shape. As poking fun at fencing jokes: Touché! I can’t think of another one; I guess I’ll just have to riposte an old one and flèche it out a bit. Are we really throwing down the dad joke gauntlet here? Because I should warn you that I have over 18 years of sparring experience. I think in the rightmost version you've lost too much of the treble clef shape. I prefer the middle version in that respect. Here's one where I tried restoring the descending curl that is an intrinsic part of the clef mark. It gets a bit busy, but I think it works more successfully as a musical reference. Fruitful etiquette for informal critiquing: stick to verbal explanations, don't actually do the work. I've thought about that, but it looks a bit too on-the-nose for my taste. The client's initial prompt also sounded like he wanted to hint at a clef rather than just paste one on top. Sorry if it was inappropriate to post a suggested form, Christian: I wanted to see it for myself before putting the idea forward, so copy-pasted across your versions. I think just flaring the top of the blade again will hint at the bottom curl of the clef without spelling it out. I agree with John: I often find visual feedback more telling than verbal, both on the giving and receiving end. I’ve often discounted verbal advice at first hearing and later found out that it worked well in practice. Curve quality, for instance, is pretty much impossible to communicate in words.